We're excited to welcome Flensted Mobiles from Denmark to the Fjorn Scandinavian site. Flensted Flowing Rhythm mobile, created in 1955. Flensted Mobiles is a family-owned company that was started in 1954 by Christian Flensted and his wife, Grethe. They created their first mobile to celebrate the birth of their daughter. The Flensted stork mobile featured three lucky storks cut out of cardboard and mounted on two sticks of straw. Lucky Storks was Flensted's first mobile, created for the birth of their daughter. Two years later, Christian Flensted left his job to devote his life to making mobiles. 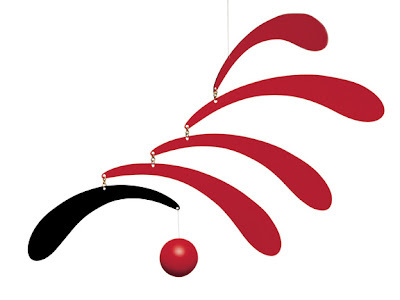 The stork mobile is still a popular gift for new mothers and babies. 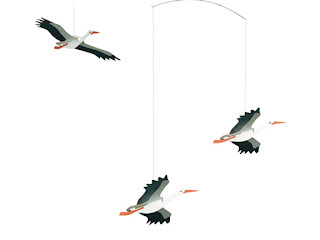 The stork mobile is still hand-made in Denmark, but the process is a bit more refined these days! Now, though, there are more than 40 animal mobiles and and another 25 children's mobiles in the Flensted collection. Futura mobile, one of Flensted's abstract collection. 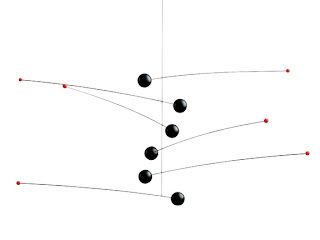 Flensted mobiles are designed to be in constant motion, yet complete harmony. And while it's true that babies love them, mobiles aren't just for the nursery. The Flensted motto is, If you have a troubled mind, watch a mobile and unwind, and Flensted modern and abstract mobiles are the perfect accent for the office or home. 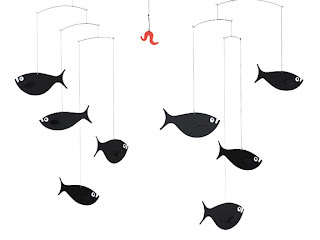 Shoal of Fish, created in 1965, is one of Flensted's most popular mobiles. The company is now based on the Danish island of Funen, and embodies a family-run, small production business. They've rejected offers from Disney and IKEA to mass-produce mobiles, preferring to focus on what they are good at -- hand-crafted mobiles made by locals in Funen. They have, however, made a Moomin mobile based on a Scandinavian cartoon about a family of trolls. Flensted is still very much a family business, with Christian and Grethe's son, Olo and his wife Aase having taken over the family business. 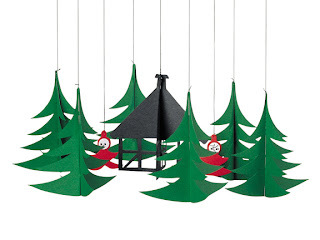 In addition to mobiles for children, they have created modern and abstract mobiles, a line of Scandinavian mobiles and special Christmas mobiles that are a beautiful Christmas decoration for any home.